I am delighted to step forward and present my candidature for a second term as Chair of Democrats Abroad Switzerland. The past two years have been exciting, challenging and extremely rewarding. Yet I am convinced that much remains to be done to build and consolidate what has been accomplished. More than ever we need to mobilize and energize democrats in Switzerland and to achieve the goals of our party. We organized a variety of issue-oriented get-togethers including conferences and panel discussions on Guantanamo, Afghanistan and other relevant current affair issues by us or other nearby country members. The next two years are critical for our party and for our country as we navigate an ever-changing political and economic environment. With the presidential race looming in the horizon, my goal is to intensify all these efforts of the past two years to draw the maximum support to our party in these trying times and to get a Democratic president elected and as always as many democrats elected to Congress. In the coming period I want to put a special emphasis on growing the number of members of Democrats Abroad in Switzerland. I hope you will continue to support my candidature for the Chair and hope I can spend the next two years working with you and for you. 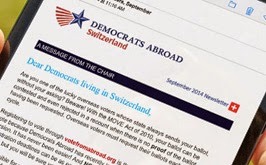 I am running for re-election as Vice-chair of Democrats Abroad Switzerland. I ran in 2013, confident I could fulfill the job description but uncertain of how much time and energy I could offer. It's worked out so well I'd like to continue to help in this worthy effort. The Vice-chair has few defined duties beyond backing up the Chair. But I committed as a candidate to sharing the Chair's various tasks as time permitted, and also to take on the tech side: The member database, website and mailings. I've met that commitment well, I think. I was driven to deliver beyond the promise, by the knowledge that my efforts were reaching Americans with important messages: About advancing Democratic policies in the US, about electing Democrats, and about issues of concern to Americans abroad. And because it's often so enjoyable thanks to the people I meet and work with. So, I make the same commitments for the 2015-17 term. Bio: I'm a software developer and small-business co-owner, married to a Swiss woman, living in Aubonne. My daughter and grand-daughter live waaay far away in New Zealand, thank goodness for skype! I would like to continue my work for DACH, with Anne-Shelton Aaron as Chair once again, for the next two years. I ask for your vote for both of us, a team that works well together. If elected, I hope to celebrate with all of you as we cheer the new Democratic President in November 2016! I hereby wish to state my intent for DACH – Treasurer 3.2015 to 3.2017. I appreciate this opportunity to introduce myself to the DACH members. Recently, I have had a increased interest in the activities of the Democrats Abroad and the upcoming 2016 presidential Elections. Since, hoping to contribute to DA and DACH awareness and organization. DACH co-organizer for 3 separate years of the Annual Softball tournament against RACH. Participate as member of Lions Club International 'Nations 102w' in all benevolent / charity activities. Please note my Linkedin profile: ch.linkedin.com/pub/christian-jordan/4/485/217/, where I invite you to review my complete professional CV/Resume. Finally, I believe that my professional experience, sport activities, scouting, family of 3 children, and benevolent activities give me a strong recommendation for DACH volunteer work of Treasurer. Thank you in advance for your kind consideration. My name is Emma Clarke and I am running for Secretary of Democrats Abroad Switzerland. I am eager to contribute to the organization and support efforts to get out the vote in 2016. I cast my first vote in the 2008 presidential election as a freshman in college and went on to major in political science. I am excited about getting involved in Democrats Abroad as a way to stay engaged in American politics from afar. I first came to Geneva as a study abroad student in spring 2011. Since then I have returned for several internships in between living in the UK and Rwanda. I now work at a global health organization. As a member of the DACH Executive Committee, I would work to use my different networks of students, interns, and international organization employees to expand the DACH membership base and register voters for the next election. As Secretary, I would bring strong organizational skills and experience in leadership roles in student organizations. In addition to keeping track of DACH's membership database and supporting meetings, I would be excited to help expand DACH's presence on social media and to help organize events for young Democrats in Switzerland. These next two years will be very important for the Democratic Party and I would be excited about the opportunity to contribute. Thank you for your support! I am the first-born of six daughters, grew up in Huntington Station, Long Island, New York. Always wanted to be an international lawyer. Attended American University, Washington College of Law because it was one of the few law schools that offered an international law program. In 1992 I decided to start working in Geneva and started my own firm with offices in New York and Geneva. I thought I would try working in Geneva as a lawyer for two years and now it is 22 years. The last 11 years I have been a partner with Wilk Auslander LLP, which is based in NYC, and I am the managing partner of the office in Geneva. My practice is in transborder technology transactions—corporate, securities, and contract law. My full professional profile can be found at http://www.wilkauslander.com/lawyers/Monroe-Karen-A and also on Linked In. I have always followed American and international politics (including as a donor) and enjoyed helping DACH during the last 2 years as counsel with particular focus on legal, including tax, issues faced by Americans living outside the USA and of course getting out the vote. I attend fundraisers in Geneva including one of the early fundraisers for the “Ready for Hillary” PAC and support some campaigns including the recent Congressional campaign of my friend, Don Beyer, former US Ambassador to Switzerland who successfully ran for a congressional seat in Virginia in 2014. I advise many corporate clients on U.S. and international legal issues and also individual clients with their special issues. I am a “friend” of the U.S. Embassy in Berne, including our new Ambassador Suzi LeVine. As legal counsel for DACH the last 2 years, I have assisted not only the organization, Democrats Abroad, with its goals but assist other members with solutions to the issues and problems which arise as American’s living abroad. My background as an international lawyer and one very familiar with USA/CH issues and two years’ experience serving as DACH Counsel fits the prerequisites for the Legal Counsel position with DACH. If I were to be re-elected, I would continue to help find solutions to some of the many issues that are faced by our members in Switzerland particularly because of the relatively volatile, yet still very good relationship, between the U.S. and Switzerland, in particular with respect to tax issues. I am very interested in legislation that would provide for a commission or some other vehicle to review all pending legislation and analyze first how it would affect overseas Americans. I am admitted to the bar of the State of New York; I am president of the Foreign Lawyers’ Section of the Geneva Bar Association, and a member of the Steering Committee of the Experts’ Network in Geneva, an organization which supports start ups and entrepreneurs. Dear fellow Democrats Abroad members, my name is Renée Rousseau - Osterwalder and I am running for the position of Non Designated Member-At-Large. I am a singer/songwriter by profession and a wife and mother of two young adult sons, one of whom is currently stateside studying Law and Political Science. I successfully chaired the Zurich/German region chapter for over two years. Under my leadership we experienced a tremendous growth with our membership and our presence in the German Region of Switzerland. Through my work with and for DA Switzerland, I have become the go to American Political Analyst/Contributor for print, digital and radio in the German region of Switzerland. I helped to organize two hugely successful Election Night events in cooperation with the SP political party of Switzerland. We have also built a very close relationship with the Woman's Club of Zurich, with whom we held many debate watch events/discussions. We have also had a very successful outreach program to moderate Republican and independent voters. Together with Mr. Charles Adams, we held a fundraiser with President Obama's former Chief Of Staff, Mona Sutphen, in Zurich. I was able to garner both of my state of Oregon Senators Ron Wyden and Jeff Merkley support for the repeal of FATCA, following the 2013 Inauguration of President Obama. They have offered their help to the DA International committee. It is my wish to continue to contribute in any way I can as a member of the DA Switzerland Executive Committee. I respectfully ask for your vote and support in my latest endeavor.